View More In Molding & Sculpting Sticks. 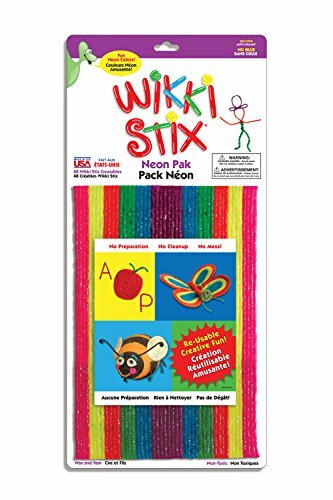 Bilingual Neon Colors (English and French) The Original Neon Wikki Stix! Includes 48 eight-inch Wikki Stix in six hot neon colors plus illustrations, play and craft ideas on the back. Perfect for home, school, playtime and more. Colors include: Hot pink, Brite Yellow, Tangerine Orange, Lime Green, Electric Blue and Bright Purple. Wikki Stix are the timeless toy for hands-on fun and traditional play. Plus perfect for educational activities and class projects. More fun than a toy. More creative than a craft! Widely used in schools, Wikki Stix conform to ASTM D-4236 and all CPSIA safety regulations. Recommended for ages 3 and up. This no-frills package offers lots of Wikki Stix creativity! Package information is totally Bilingual. If you have any questions about this product by WikkiStix, contact us by completing and submitting the form below. If you are looking for a specif part number, please include it with your message.